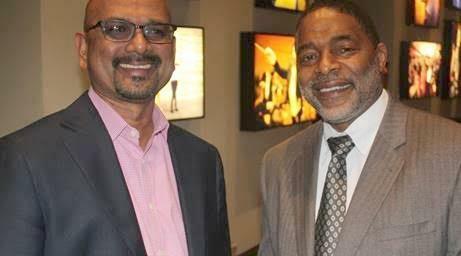 * L.A. Times’ Editor-in-Chief and Publisher Davan Maharaj and FOX Sports and KABC-TV’s Sports Analyst, as well as businessman Norman Nixon, at the first Los Angeles Times African American Business Forum held recently at the historic LA Times Building in downtown Los Angeles. The standing room only audience learned from a panel of African American business experts which included; Keynote Speaker: Norm Nixon, FOX Sports Analyst, Co-Founder of Debbie Allen Dance Academy, former NBA Lakers & Clippers player, Real Estate Investor; Panelists: Carl Dickerson Founder & Chairman, Dickerson Employee Benefits; Lemuel Daniels, VP and Financial Advisor, Morgan Stanley; Ron Lowe, Sr. Dir.-Finance MBDA, Mayor’s Office of Economic & Business Policy; James Lott, Attorney Advisor, U.S. Patent and Trademark Office; Edna Sims, Founder, ESP Public Relations; Kevin Hannahs, Regional Dir. LA, H&R Block and Moderator: Tanya Hart, TV host/producer/radio personality, American Urban Networks & Tanya Hart Communications. Norm Nixon, forever memorialized as one of the greatest talents in the NBA, is an accomplished businessman and humanitarian. Upon making NBA history as a two time all-star and a member of two NBA world championships as a Los Angeles Laker, Mr. Nixon retired from the NBA in 1989 and concentrated on several business ventures. During his playing years, Mr. Nixon was the Vice-President of the NBA Player Association. The Los Angeles Times’ Multicultural Business Forums aim to inspire, empower and educate the various communities on growing their businesses. These Multicultural financial workshops give attendees the unique opportunity to have industry professionals answer questions.